Balanced Omega Fatty Acids: Why Do Birds Need Them? – Pet Birds by Lafeber Co.
Fatty acids are the building blocks for fats and oils in the body. All animals, including birds, need them. Recent research has shown that balanced omega 3 and 6 fatty acids in the diet are good for a whole host of body functions. When these omega fatty acids are available in the right proportions, or balanced, they help the immune system and the body’s ability to respond to disease and precancerous conditions. This means that the immune cells are able to fight off infections and not over-respond, as occurs with allergic responses. In people, balanced omega 3 and 6 fatty acids have even been shown to reduce the incidence of colon cancer. They keep the joints healthy and have been shown in dogs to reduce osteoarthritis and the pain associated with this chronic disease. This reduction in inflammation is important in many disease conditions, including kidney failure and liver disease when chronic. We also believe that balanced omega 3 and 6 fatty acids in the diets of pet birds will also help to keep birds healthy, as has been shown in poultry. The two basic families of fatty acids are the omega 3 series and the omega 6 series. The numbers in the names refer to where the first double bond in the backbone of the molecule occurs, either at the third or the sixth position. The omega 3 family of fatty acids includes linolenic acid and all of its elongated products. Common sources for omega 3 fatty acids in human diets are coldwater fish and walnuts. The omega 6 fatty acids include linoleic acid and its group of products.Common sources for omega 6 fatty acids in human diets are eggs, poultry, cereals, vegetable oils and baked goods. The dietary requirements of the omega 3 fatty acids do not reduce the need for the omega 6 fatty acids because they are not interchangeable. Both are required by the body, and both need to be consumed in proper balance for optimum health. The balance between these two fatty acid families is important, because higher levels of omega 6 to 3 fatty acid levels appear to promote inflammation, while higher omega 3 to 6 levels are anti- inflammatory. This is most likely the result of the omega 6 series acting as precursors to the proinflammatory prostaglandins, leukotrienes and the thromboxanes. These products are produced as a result of the inflammatory process. Once these products are produced, they set up a cascade of events that continue the inflammatory process. When the omega fatty acids are in balance, this cascade of inflammation is dampened. This helps the immune system to work properly and the organs to function normally. Fatty acids like the omegas can easily become rancid so that they are no longer effective. Heat can also destroy them when they are in foods or in the oil form, so they need to be kept cold or stabilized by a natural preservative. Foods that are high in the omega 3 series are flax seed (better than the oil as it less likely to turn rancid), walnuts and other true nuts. Food cooked on a low heat with canola oil for your birds can also provide a source of the oil. Foods high in the omega 6 series are sunflower seeds. as well as other common seeds in bird foods, corn and grains. It is not that you don’t want any of the omega 6 products; you want the balance to be correct. 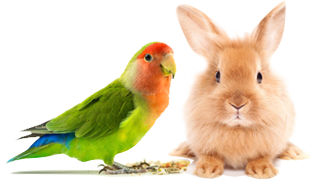 Lafeber Company is leading the bird food industry by providing properly balanced omega 3 and 6 diets. Atherosclerosis, or hardening of the arteries, is fairly common in captive birds. Factors that have been linked to the development of atherosclerosis in pet birds include longterm diets high in fat or cholesterol and/or lack of exercise. Dietary PUFAs, especially omega-3 fatty acids, play an important role in the prevention of atherosclerosis by inhibiting inflammation within the blood vessels, reducing plaque formation and by other means that protect the vessels. Bavelaar FJ, Beynen AC. (2004). “Atherosclerosis in parrots: a review.” Vet Q. 26:50–60. Das UN. (2006). “Essential fatty acids: biochemistry, physiology, and pathology.” Biotechnol J. 1:420–439. Petzinger C, Heatley JJ, Cornejo J, et al. (2010). “Dietary modification of omega-3 fatty acids for birds with atherosclerosis.” J Am Vet Med Assoc. 236 (5):523-527. Pees M, Krautwald-Junghanns ME. (2006) “Evaluating and treating the cardiovascular system.” In: Harrison GJ, Lightfoot T, eds. Clinical Avian Medicine. Vol 1, 379–394. Palm Beach, Fl: Spix Publishing.